Having lived in our 1930,semi for almost 25 years, we decided to look at replacing our kitchen of almost 20 years, which although fair in condition was looking a little tired. Our vision was to renew the whole kitchen and where practicable remove part of the wall to make a kitchen / dining area. We employed DPJ Build to carry out the works and from the first meeting Danny,s passion for design and change was evident. The work was scheduled for 3 weeks. Danny project managed and Lee, Avery experienced joiner ran the scheme from start to finish. Danny and Lee have a passion for their work and throughout the whole process we were kept informed of every element of work. The other trades within DPJ Build turned up when required and provided the same level of quality and finish. This showed with the finish of plastering / electrical / plumbing works. Danny and his team all work with an amazing sense of pride in what they do, an this shows in the finished product. The works were kept clean and tidy every day and all waste was removed and placed in skips. The final stage was to install our new kitchen which Lee took on himself. From start to finish his passion for joinery and installation produced what became an amazing kitchen dining layout, which included Danny,s recommendation (at the start of the works) of removing the whole dividing wall between the kitchen and dining rooms. We have been given a space which is far beyond what we imagined. Danny Jobson inspired confidence from our very first meeting. The work to convert our garage into a utility and sun room started and finished on the exact days that he said it would. The builders were punctual and tidy. Communication was excellent, with Danny listening to our ideas and meeting our requirements. The finished job is perfect. Danny and his team recently refurbished the ground floor of my 1930s built, semi-detached, 4 bedroom property. This included the removal of a tired, flat kitchen roof which has been replaced by a beautiful extended hipped roof with large velux and new French doors out to the garden. 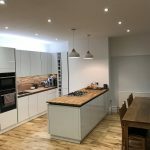 There were some significant room function moves, a new kitchen installed, more walls removed to create an open plan diner and a utility room built with new external doors to garden. The work was carried out with excellence by Danny’s team, having a real eye and care for detail. Lee, a highly skilled and extremely patient joiner even went to lengths of creating some missing entrance hall panels with the correct period features from scratch. Danny is a highly skilled project manager where every aspect of the complex build (dealing with lots of different trades) was kept on track and very importantly, on budget (no overspend was incurred during our build). The build was finished exactly to when was committed at the quote stage. The job was kept amazingly clean and tidy and all removal of rubble (with skip changes) is managed by the team. The plastering finish and electrical installation is the best we have ever had, having renovated previous period properties. Any inevitable snags which occurred during this kind of renovation were dealt with immediately by the team and even when the project was finished and signed off by the building control team, the team have been available to finalise any small issues that have arisen. Finally, the communication of the build team to customer is excellent. I was always aware of what was happening on any given day of the 6 week project. We are truly delighted with the end results of this particular phase of our house renovation. I can honestly recommend DPJ as the best team of project managers and tradesman I have worked with. I will be working with them again when we complete the final phase to complete our home (if I’m lucky enough to secure their time). We employed DPJ to fully renovate and extend our 4 bed 2 bath house into a 5 bed 3 bath house with major internal alterations. The project was extremely extensive, and included entirely new roof, full rewire and plumbing system, all new bathrooms, windows and staircase-essentially a new house! Danny personally managed the process from start to finish, was always contactable day or night throughout and continuously came up with ideas which has ultimately resulted in a property better than we could have ever imagined. His professionalism, knowledge and expertise and in particular his attention to detail is second to none, and he has a particular knack of embedding this ethic and vision into and throughout the teams that work for him, which is a skill in itself. This left us having complete trust in his ability to deliver our dream home. Taking on a project of this size can be daunting, in particular in respect to budget, however Danny made sure his price was his price, and any variation to this was through ourselves enhancing original specification, and was all agreed in advance. Danny and his team delivered us a home better than we could ever have imagined, and most importantly for us, to the day of his programme issued to us some months prior. We were lucky to find a company with such integrity and pride in their work, and would not hesitate in recommending DPJ. We employed DPJ to carry out the conversion of a 2 bedroom bungalow into a 3 bedroom house with 3 bathrooms and an office . The work was very demanding as it involved completely reconfiguring and extending the ground floor, fitting a staircase and installing a new roof incorporating a feature dormer window with Juliette balcony. Their attention to detail was first class and they made sure that the finish was faultless. Danny has an excellent knowledge of construction and first rate project management skills to ensure that the job was completed on time and within budget using craftsmen who all have a similar approach . We would recommend Danny to anyone who needs a quality job completed and we are sure that you will not be disappointed. If we have another project we will be sure to use Danny whether it be a large or small job. DPJ have recently completed a loft conversion and kitchen extension for us and we’re extremely pleased with the result. Danny is very professional and really easy to deal with. From day one we felt as though we were in safe hands. He’s a great project manager, co-ordinating all the elements of the job to ensure it ran smoothly and finished on time. Throughout the build the communication was fantastic, and we were always kept informed. Both Danny and his team have high standards, with great attention to detail which was very important to us. They are extremely reliable and hard working and as they’re so friendly they’re a pleasure to have around. We’re very grateful DPJ made the process as stress free as possible and can’t recommend them highly enough. DPJ helped transform what was a tired and oddly shaped kitchen into a large open stunning kitchen. Danny and his team were punctual, worked extra hours to get the job done and always tidied up at the end of the day. We cannot fault the standard of workmanship and would recommend DPJ to anybody looking for a trustworthy, affordable and professional builder. Rarely do you get what you ask for – particularly with the building trade! So it was with great apprehension that we asked for prices to remove an old extension and conservatory to be replaced by a kitchen/diner. DPJ’s quote was as requested: fixed price and itemised, making it quite clear what he was charging for and what was not included. We also needed our roof-line sorting before it fell down and Danny offered to do this work initially. Everything was delivered on the day, as per schedule, and at the agreed price. Danny seems to attract tradesmen – both employees and sub-contractors – with the same dedicated work ethos. And the ability to wield a sweeping brush was an added bonus. I was also impressed by his building knowledge which was freely offered as I was doing some of the finishing work. We have had many positive comments from friends and neighbours for both the extension and the roof. We were so pleased with the work – seeing our vision turned into reality – and we would happily recommend Danny’s team for anyone’s project. When I decided I wanted to divide an existing bedroom into an ensuite off the main bedroom, create a study in the other half and refit the existing bathroom I relied on friends and family to provide details of possible builders. Having spent best part of 18 months listening to the reasons why I couldn’t have what I wanted or waiting for estimates which never came and promises of starting work at a point in time that never happened I decided I would give someone a go who hadn’t been directly recommended by family or friends. I had seen DPJ vans around the area and my first attempt to contact them resulted in a same day call back and an arrangement for Danny to come and look at the job. From then on nothing was a problem. He gave an air of quiet confidence, produced a competitive estimate within the same week and a possibility of starting within 6 weeks. Even when I had to put that back because of family health problems it wasn’t a bother. His team turned up on time and got on with the job under the supervision of Danny. Every one of them were courteous, friendly and hard working – staying on at the end of the day to complete whatever task they were working on – and always tidied up before they left. If I made changes or asked for extras along the way Danny always listened, passed on the requests to his men and it was done without any fuss. The work was completed to an exceptional standard within the time specified – 10 days – amazing. I would definitely recommend DPJ and they are certainly where I would go if I needed more work doing – indeed I asked him to lay a wooden floor in the study which was done to perfection. Thank you Danny for making life easier and I am delighted with the finished job. My Wife and I are long term residents of Whitley Bay and over the last 5 years have used DPJ Build as our Main Contractor of choice for a wide range of projects both at our family home (in particular a comprehensive refurbishment of a 1960’s 3 bedroom detached bungalow) and at various buy-to-let properties we have bought, refurbished and let. All projects have been delivered to the agreed timescale and at a pre-agreed price which has in every case reflected good value for money for the quality of work delivered. The core attributes which, for us, differentiates DPJ Build and in particular Danny Jobson, the Director are Reliability, Honesty, Determination, Value for Money, Quality of Design and Construction and Excellent Project Management Skills; in particular the effective management of Sub-Contractors. We have no hesitation in recommending DPJ Build for domestic and commercial building work. I would like to thank you and your team for the exceptional work you have done on our new Benton Factory. All work on building the new office, showroom and work stations is of an exceptionally high standard. Great to find a competent reliable building company. I would have no hesitation in recommending DPJ Build to anyone. Our kitchen extension was not an easy project to undertake and a number of builders turned the project down before I found DPJ online. I spoke with a number of previous customers who were very happy to recommend them, so we decide to go ahead. All work is quoted and agreed before commencement. They are on site when they say they will be and drive the project through to completion.Common to period property like ours, we encountered a number of unforeseen structural problems during the work and Danny was quick to respond and find a solution so as not to delay the work more than necessary to rectify them. Danny and the team are extremely professional and the work they produce is of the highest standard, what’s more, our building inspector expressed the same opinion during his final visit. I could not be happier with the quality and finish of the work. It was our extension that got Danny to the LABC building of excellence awards final.We were delighted with the extension that he built for us, from start to finish the process was managed with precision and the site kept clean and tidy throughout. We were very impressed with Danny’s professionalism and care and would definitely recommend his company for any further building requirements. We have recently used DPJ Build to transform our bathroom and toilet facilities and were very impressed with their professionalism and care in which they carried out the work. They were very well presented and left the job clean and tidy each day. I would definitely recommend DPJ for any building requirements. DPJ have recently transformed our bathroom and what an amazing job. We are so delighted with the end result. Once the work was agreed we were confident and happy to let them get on with it, they proved to be efficient, reliable and pleasant to have around. DPJ is without doubt the best company we have ever used, they consistently work at such a high standard and nothing short of perfect will suffice. We would not hesitate to recommend them and will definitely use them again in the future. Thank you so much for our terrific bathroom. I have been extremely happy with the work carried out by DPJ Build. All the work was quoted for before beginning work and the whole kitchen refurbishment was project managed by Danny. I had no worries at all about getting an electrician, plumber, plasterer and tiler as Danny co-ordinated all this for us. Danny and Lee are punctual, extremely hard working, keep you informed all the way through the project and keep the site clean and tidy We had an unforeseen problem with a structural wall but this was all dealt with very professionally and the problem was sorted very quickly and with no inconvenience to us. The final kitchen looks amazing and I am delighted with it. The work is to the highest standard and I have no hesitation in recommending DPJ Build to anyone. Danny and his team did a superb job on our kitchen garage conversion and bathroom refurbishment. Their advice, expertise and professionalism were excellent. All work was completed to the highest of standards and we would not hesitate to recommend them. Customer satisfaction is our key priority and we achieve this by keeping in close communication with you at every stage. This allows us to listen to your ideas, offer cost-saving advice and ultimately ensure you are completely satisfied with the final product. Whether you need a stylish new extension, or a complete new build home, we deliver quality workmanship, on time and to budget. So why not give us a call today and take advantage of our free, no obligation quotation service. Contact us on 0191 289 2076.